Basenjis by nature are not big fans of people, they prefer the dog species and in general are very independent. 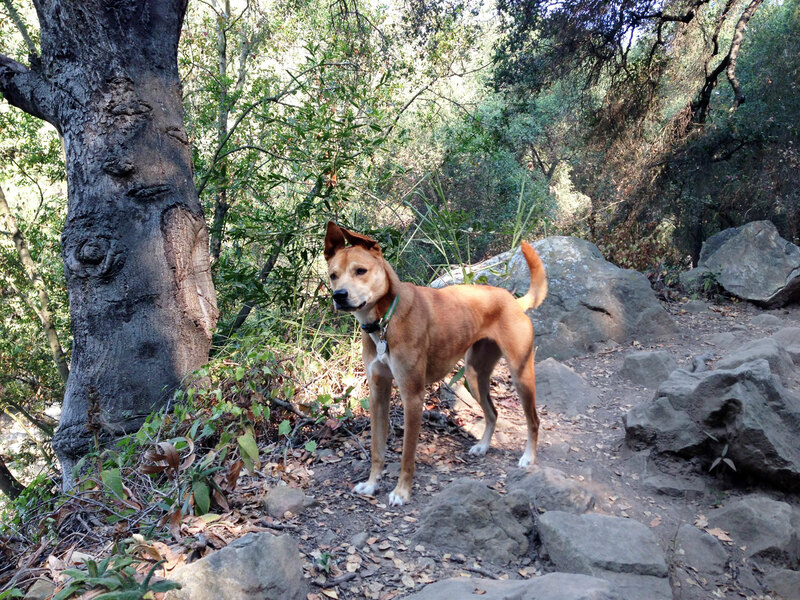 While Zoe is a mixed Basenji she absolutely carries on this trait, except when it comes to people in her pack. I have always been someone that has a few close friends rather than many casual friends, so this trait works well for me. The people whom I am close to in my life and that Zoe knows well have also become her pack. The other day we were hiking with a couple other people and one of them was a bit behind doing something. Zoe stopped on the trail and turned around with the full attention look you see above. She wouldn’t continue until our total pack was together and heading in the same direction. There have been times when I have gone hiking with my mom and she needed to leave early, so she said goodbye and headed the other direction. Zoe was not happy about this development. She proceeded to run back and forth between us about ten times very unsure about why her pack was splitting up. Eventually she followed me down the trail but not without a clear stern look making sure I knew she did not approve and was very concerned about the well being of the pack. It was only when I reassured her that we would be seeing her again soon and that she wasn’t really leaving that she seemed a bit more okay with the situation, yet still not approving. About a week ago my dad was driving and saw Zoe with Cicciu being walked by one of Cicciu’s humans. My dad pulled over to say hi to Zoe and when he left to continue with his day Zoe sat there and watched him, whining a bit and not wanting to continue on the walk. Why was he leaving? Why wasn’t he joining the pack? Didn’t he know he was part of the pack and the pack at all costs must STAY TOGETHER?!? I think us humans share similar feelings, we like our pack together. Granted, Zoe isn’t a solider but the mentality seems fully engrained in her . If we think about our loved ones, don’t we feel better when they are close? I know I feel better when they are all closer to me instead of far away. My brother recently moved back to Santa Barbara earlier this year after many years in school and I love living in the same town as him, taking advantage of fun adventures, or just grabbing a cup of coffee. The ability to spend time with those you love and to have them in close proximity enriches our lives. My grandma on my mom’s side always says when one of her kids is away that she doesn’t like them to be too far, she likes them all close. So does Zoe, she likes all her pack close, and she is not about to leave a pack member behind.